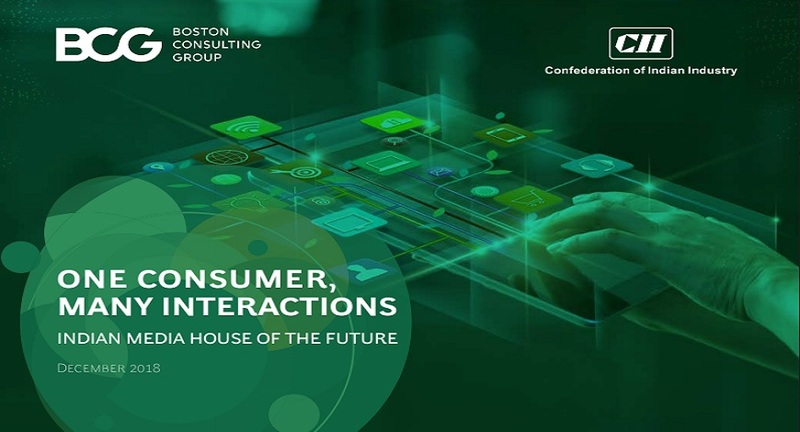 Boston Consulting Group (BCG) and Confederation of Indian Industries (CII) has released a report, 'One Consumer, Many Interactions', that reimagines the media house of the future. The report highlights the massive, unparalleled change the media and entertainment industry is going through, with the exponential growth of media and type of content available creating a trillion customer touch points. Speaking about the report, Sudhanshu Vats, Chairman, CII committee on Media & Entertainment and Group CEO Viacom 18 Media, India said, "This change is not the future but rather is here & now". He added, "This is an unparalleled situation even for an industry which has always been at the forefront of disruption. The industry will now need new answers, and will need them fast even on the most fundamental things like talent pool to run our companies, methodology for measuring the impact we are delivering to advertisers on our platforms"
According to the report, India's media consumption has been growing at 9% CAGR over the past six years, which is almost twice that of China and nine times that of the US. But there is still ample headroom for faster growth in the future. The report points to India's unique multimodal growth across all major media, which is unlike any of the other key markets. Kanchan Samtani, Partner & Director, Boston Consulting Group India, elaborated upon this uniqueness: "India is one of the few countries in the world where we are witnessing most mediums growing hand in hand and we see this continuing in the foreseeable future. For example – video consumption on OTT is supplementing linear TV versus cannibalizing it." This growth will fundamentally change the way media houses look and operate; the changes will range from rethinking the front end content involving format and language to reorganizing the back end with newer skill sets and partnership models. New age technologies like artificial intelligence and analytics are getting ingrained in each function of media operations. "The industry has to re-write many definitions and conventions on almost a daily basis. While the erstwhile, fixed prime time for TV for family in the evening remains, many new personal viewing occasions have come via OTT (over the top) screen consumption," observed Karishma Bhalla, Partner & Director, Boston Consulting Group India. The report showcases real-life examples of successful new age media and entertainment companies and highlights the need for media houses to work closely with other stakeholders. In Samtani's view, "The media industry is leveraging technology at a very fast pace. We expect media companies to invest a significant amount of time and resources to create technical prowess as a key pillar of differentiation. Mr. Vats highlighted the call for action: "The questions are manifold but this is a tremendous opportunity for our industry to reimagine itself. We hope that this report helps our industry executives think through the imperatives and drive action."